Glass whiteboards are quickly becoming the best whiteboards on the market; they’re made from a high-quality, tempered glass and are both easily to clean and virtually unbreakable. Glass whiteboards can actually last a lifetime if you take care of them, which you could never say about a traditional whiteboard that typically lasts five to ten years, tops. For use with super strong neodymium magnets. Our Glass-Magnetic Colour selectable Memo boards made from Security Glass (ESG) will defintely create a stylish look within your home and office rooms. 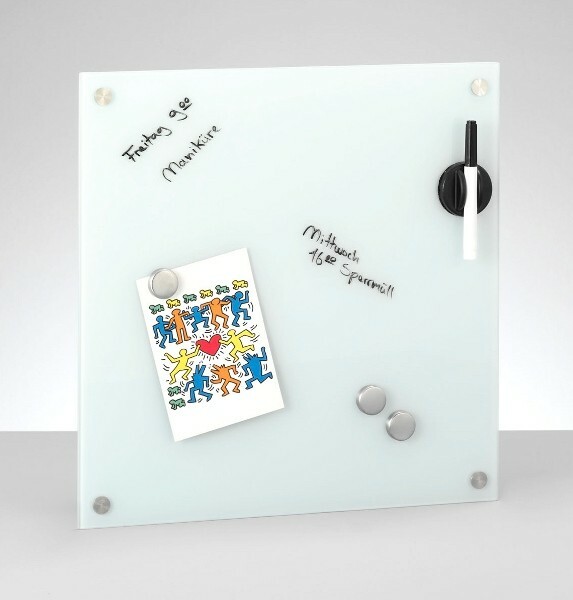 The boards glass surface has a dual function, allowing it to be used as both a dry eraser board and a magnetic memo board. The surface can be written on using a dry erase pen and notes can be attached using neodymium magnets. The glass surface is classic and modern. It can be used both in the office as a trendy alternative to the conventional magnetic boards available on the market, or simply as a notice board or wall planner for your home. The high-quality, multi-functional glass surface is very simple to write on and can be cleaned easily using a simple cleaning cloth. With a quick and easy installation, this board includes mounting screws and wall plugs. Normal everyday magnets will not stick to the boards and should only be used with SuperDym or NeoDymium Magnets. The magnets can be at Magnosphere.co.uk. Why a Magnetic Glass Whiteboard? Glass whiteboards are quickly becoming the best whiteboards on the market; they’re made from a high-quality, tempered glass and are both easily to clean and virtually unbreakable. Glass whiteboards can actually last a lifetime if you take care of them, which you could never say about a traditional whiteboard that typically lasts five to ten years, tops. So if you’re deciding to buy a whiteboard your best choice is already a glassboard, but you can actually go one step further and buy a magnetic glassboard. Great for the Home – Many families use their refrigerator as their giant magnetic glass marker board, which can be great when you’re in a bind, but you can constantly have important papers flying off every time someone opens the fridge for a snack. 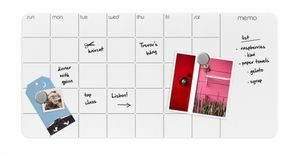 Use your glass magnetic board for holding those important bills, notes, and reminders so you never have to worry if something got kicked under the fridge or fell in a crack in the kitchen. Plus, you can place the glassboard anywhere; in the family room, in the home office, or in the kitchen. Uses for the Office – Magnetic glassboards are amazing for any office, since they offer a sleek and modern look, they can become the central hub of communication, and they are great for presentations and scheduling. You can use the magnets to post important notices, to rearrange schedules quickly and easily, or to reward employees with praise. Don’t Forget the Classroom – Teachers tend to focus all of their teaching, instruction-giving, and planning on the front of the room; more notably, on the whiteboard. The whiteboard is a great place to give students their assignments and to praise them with their great work. 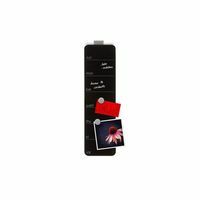 Our glass boards are great for using as a backdrop for a projector as well, and you can easily incorporate magnets into your presentations. Who supplies high quality Magnetic Glass Boards? Magnosphere offers best priced Magnetic Glass Boards globally to all industries, including Automotive, Aerospace, Military, Advertising, Design House, Electronic and Academic/R&D. Please inquire for custom Neodymium magnets or magnetic assembly. Buy Magnetic Glass Boards at Magnosphere and get a better deal!